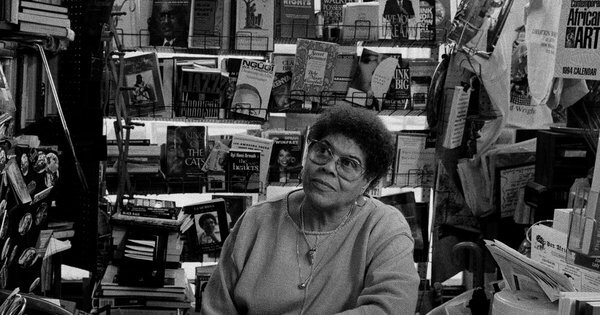 The New York Times’ dismissive, error-strewn obituary of Una G. Mulzac, the late proprietor of Harlem’s now-closed Liberation Books, cast her as a cantankerous crank-pot holding anachronistic political beliefs. Yet for many people, folk like Mulzac were historians, vernacular archivists, and living repositories of pan-African memory. Places like Liberation Books – alongside San Francisco’s endangered Marcus Books, Toronto’s long-shuttered Third World Books & Crafts, and a host of other stores – doubled as public libraries, informal classrooms, and sites of pilgrimage. The daughter of Hugh Mulzac, author of A Star to Steer By and a shipmate on Marcus Garvey’s Black Star Line, Mulzac was an activist in her own right and through Liberation Books, she staked a claim for bookselling as a political act. Unfortunately, it’s a claim that is losing ground as fast as independent Black bookstores have been closing. While the era of Amazon and AbeBooks has provided us with greater access to Black literature than at any time in history, one-click purchases and algorithmically-determined recommendations can never replace the intimate and independent Black public spheres created by booksellers like Mulzac and bookstores like Liberation Books. No wonder the Times’ contempt. Given the history of Mulzac and Liberation Books, it’s appropriate that Kenyan playwright, novelist, and critic Ngũgĩ wa Thiong’o peers out from behind her in the above photograph. Ngũgĩ’s classic Decolonizing the Mind: The Politics of Language in African Literature (James Currey) demonstrates an acute understanding of the political economy of knowledge in the colonial context while arguing that alternative languages, genres, and venues were necessary for the project of post-colonial freedom. At one point abandoning the English language to write only in Gikuyu, Ngũgĩ has returned from his self-imposed linguistic exile with a productive flourish. In 2007 he published the masterful absurdist political satire The Wizard of the Crow. He has followed it with three volumes of criticism and two installments of a memoir. The criticism revisits the terrain of Decolonizing the Mind while confirming the continued importance of its interventions in the contemporary historical context. With its title borrowed from poet Kamau Brathwaite’s Islands, Ngũgĩ’s Something Torn and New: An African Renaissance (Basic Civitas), is a wide-ranging but compact exploration of African independence, freedom, and what George Lamming has called the “sovereignty of the imagination.” Globalectics: Theory and the Politics of Knowing (Columbia) approaches questions of national identity, internationalism, and literary and cultural production within the landscape of neocolonialism and neoliberal globalization. In the Name of the Mother: Reflections on Writers and Empire (James Currey) consists of critical essays on a range of writers, from Ousmane Sembene to Tsitsi Dangarembga. In his memoirs, Dreams in a Time of War: A Childhood Memoir (Random House) and In the House of the Interpreter: A Memoir (Random House), Ngũgĩ provides readers with a personal account of the experiences and transformations that led to the critical turns of his intellectual and political development. The publication of Ngũgĩ’s memoirs has been complemented by the recent release (and in one case, re-release) of a number of biographies of major figures of anti-colonial struggle within the African diaspora. In the exceptional Eslanda: The Large Unconventional Life of Mrs Paul Robeson (Yale), historian Barbara Ranbsy has brought Elsanda Goode Robeson out from the shadows of her often-over shadowed husband. Eslanda Robeson was tirelessly committed to women’s liberation, anti-racism, and anti-colonialism. She was also a journalist and an anthropologist who trained with Bronislaw Malinowski and wrote the neglected monograph African Journey in 1941. Rambsy recounts Robeson’s intellectual and political career – including her unflinching testimony before the House Un-American Activities Committee – while reconstructing the complex contours of her longstanding and unconventional relationship with Mr. Robeson. It’s an engaging history of Black politics – and of Black love. The late David Macey’s comprehensive, unsurpassed, and unsentimental Frantz Fanon: A Biography, first published in 2000, has been updated and re-issued by Verso. Macey, who remembers buying his first copies of Fanon at Francois Maspero’s La Joie de lire bookstore in Paris (which he describes as “as much a library as a bookshop”) recovers Fanon from those who dismiss him as an angry apostle of anti-colonial violence – or embrace him simply as a silly postcolonial theorist. He also claims the contemporary relevance of Fanon in Algeria, France, and the départements of Gaudeloupe and Martininque. In S is for Samora: A Lexical Biography of Samora Machel and the Mozambican Dream (Columbia/Hurst), Sarah LeFanu breaks with biographical tradition and orders the narrative of Mozambique’s independence struggle and the history of its assassinated leader around a series of charged keywords. The results make for smart, compelling reading. Claremount Chung has edited the transcriptions of his interviews with Walter Rodney’s friends, colleagues, and acquaintances for the documentary W.A.R. Stories: Walter Anthony Rodney, and collected them as Walter Rodney: A Promise of Revolution (Monthly Review). Inspired and moving, Chung’s compilation contains evocations of Rodney’s life and testimonials of his legacy from the likes of Robert Hill, Amiri Baraka, Leith Mullings, Issa G. Shivji, Clive Y. Thomas, and Rupert Roopnaraine. Poet, editor, essayist and publisher Miguel D. Mena has been a force in independent publishing in the Dominican Republic since the mid-1980s. He is currently editor of Cielo Naranja, a fantastic website that serves as a portal to a rich archive of editorials, essays, and commentary on Dominican intellectual history, the place of the Dominican Republic in the context of the wider Caribbean, and of Dominican architectural and urban studies. Mena has also launched the imprint Ediciones Cielonaranja as an outlet for inexpensive though smartly-packaged re-issues of out-of-print classics of Dominican history, criticism and poetry. Thus far, Ediciones Cielonaranja has published a series of titles by Rene del Risco Bermudez, Juan Sanchez Lamouth, and Fabio Fiallo, and others under the banner Biblioteca de literature Dominicana; a number of historical compilations through its Coleccion archivos, and, via La Biblioteca Pedro Henríquez Ureña, the collected work of the early twentieth century Dominican humanist, philologist, critic and editor. The output of Mena (he has just published a remarkable three volume study of the poetry and poetics of Dominican urbanism) and Ediciones Cielonaranja has been nothing short of astonishing. Also coming from the Spanish-speaking Caribbean are a trio of monographs that are both path-breaking and genre-busting. Alexandra T. Vazquez’s Listening in Detail: Performances of Cuban Music is a shot across the bow of the fetishistic collecting of Cuban cultural production by imperial ethnographers as well as an exploration of performance, circulation, and interpretation that is both muscular in analysis and nattily elegant in style. Bárbaro Martínez-Ruiz’s Kongo Graphic Writing and Other Narratives of the Sign is a learned, lucid and pioneering exploration of indigenous Central African writing systems and their emergence in the greater Caribbean. Exhaustively researched and full of trenchant interpretation, Jossiano Arroyo’s Writing Secrecy in Caribbean Freemasonry (Palgrave MacMillan) recovers the presence of Masonic signs, systems, and rituals in the dissident, anti-colonial writing of nineteenth-century Caribbean intellectuals Andrés Cassard, Ramón E. Betances, José Martí, Arturo Schomburg, and Rafael Serra. Finally, Kingston, Jamaica’s Ian Randle Publishers has just released three readers dedicated to Caribbean thought. The first two, Caribbean Political Thought: The Colonial State to Caribbean Internationalisms and Caribbean Political Thought: Theories of the Post-Colonial State were edited by political philosopher Aaron Kamugisha of the University of the West Indies, Cave Hill. The Colonial State to Caribbean Internationalisms offers a simply astounding compilation of five-hundred-years worth of manifestos, constitutional excerpts, and speeches – from Jean-Jacques Dessalines famous “Liberty or Death” proclamation to the interventions of Sylvia Wynter, with contributions from Aime and Suzanne Cesaire, Antenor Firmin, George Padmore, Marcus Garvey, Frantz Fanon and others along the way. It includes the 1912 program of Cuba’s Partido Independiente de Color and Dantes Bellegarde’s 1930 appeal to the League of Nations on the threat of the United States to world peace. Theories of the Post-Colonial State comes as a continuation of the first volume and focuses on the post-World War II examination of Caribbean political life after independence and decolonization. Kamugisha assembles a jaw-dropping collection of theorists and intellectuals including Michel-Rolph Trouillot, Norman Girvan, Eudine Barriteau, Patricia Mohammed, Stuart Hall, and Edouard Glissant, to name but a representative few. The third volume, Caribbean Cultural Thought, was co-edited with Yanique Hume, a critic and dance who also teaches at UWI Cave Hill, and contains the formative interventions on Caribbean aesthetics, sexuality and gender, cultural identity, nationalism, and social change, and religion and spirituality. Dedicated to the peoples of Haiti, Jamaica, and Trinidad – and to the region’s thinkers and theorists – together, these readers are indispensible guides to the intellectual history of the region. On their publication, Kamugisha gave thanks “to the ancestors for Caribbean thought in pursuit of freedom.” We’re sure it’s a sentiment Una Mulzac would have approved. Image: Una G. Mulzac (April 19, 1923 – January 21, 2012) in Liberation Books, Harlem, USA. Source: Harlem World Magazine. Radical Black Reading: 2011. 2012. Reading Haiti: 2011. 2012. Radical Black Cities: 2012. This entry was posted in Haiti and tagged archives, history, knowledge, reading. Bookmark the permalink. Post a comment or leave a trackback: Trackback URL.